Did you know that America's beverage companies produce 100 percent recyclable products - even the plastic caps? We all need to take an active part in ensuring we're recycling the products we use every day. Here are some ways we can sharpen those recycling skills at work and at home. A common misconception is that crushing up aluminum cans is the best way to toss them into recycling bins, but next time just give the container a good rinse instead of flattening them. The same goes for plastic containers, make sure they're rinsed before they go to recycling. 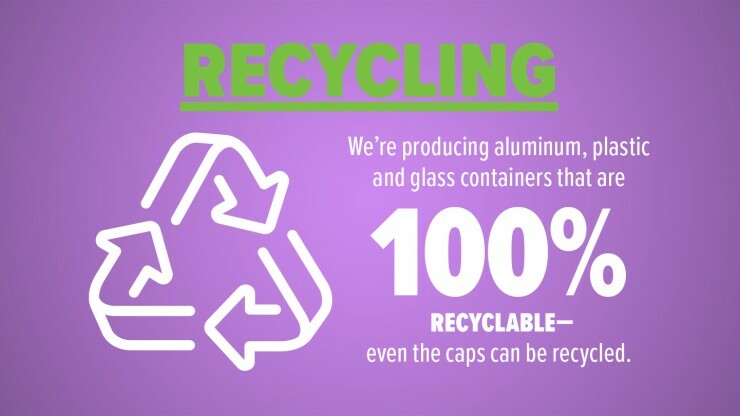 According to innovationnaturally.org, "39 percent of our aluminum, plastic and glass containers are recycled in the United States, up eight percentage points in the last eight years." Here are some ways to keep those percentage points rising: always make sure to secure the cap on your beverage container before recycling it and make sure there's a recycling bin next to your regular trash bin to make it easier to establish a habit. These tips will help create a healthier environment for all. With glass containers, you can get creative and repurpose them: turn your glass bottles into vases for your flowers or turn empty jars as containers for your work lunches. The options are pretty endless, check out this BuzzFeed article explaining other creative methods to repurpose glass. We all have a role to play in prioritizing the health of our environment. Take a page from America's beverage companies who are "working to eliminate waste to landfills; 93 percent of waste from our manufacturing plants is being recycled and diverted from landfills." Check out innovationnaturally.org for more facts and figures on our industry's environmental initiatives.